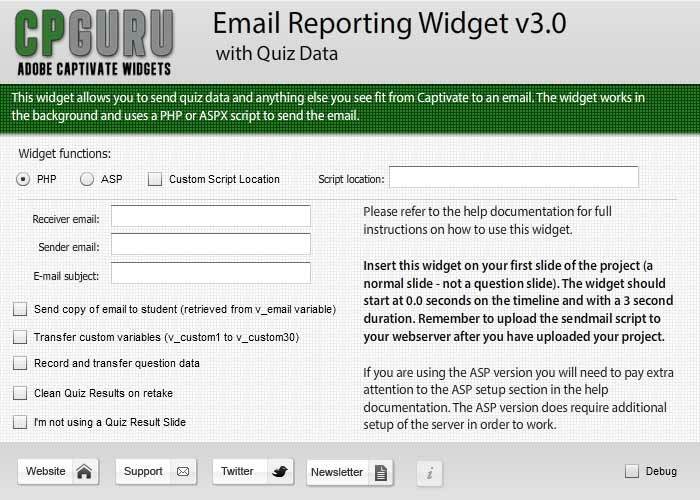 The Email Reporting Widget for Adobe Captivate will automatically send an email with quizzing, access and other information to an admin email-address that the developer specifies in the widget parameters. The Widget uses a PHP / ASPX script to send the email in the background without prompting the user or requiring any action from the user.. In addition to sending the variables concerning quiz data from Captivate you also have the possibility to send up to 30 user defined variables / custom variables from Captivate. This allows you to transfer additional information from your project and include it in the email as well. The regular Email Reporting Widget, which will send you project information, date, time, student name (if entered in the project), quiz scores (percentage, score, no. of correct answers, no. of skipped questions, no. of quiz attempts, points scored, total points available, points needed for a pass). In addition to all this data you have the option to transfer up to 30 custom variables from your project. The Email Reporting Widget with Quiz Data, which will send you all the information as mentioned above but in addition to this it includes details about every single question in your project and the users answer to them. Question Text: Does this new widget work with Adobe Captivate 7? The Email Reporting Widget with Quiz Data will send the results whenever the Quiz criteria have been fulfilled. This means that if you have a quiz in your project and the user passed the quiz the widget will automatically send an email once this happens. The same will happen if the user fails the quiz and it is not possible to retake the quiz. If you have a quiz that allows multiple tries, the widget will send the email once all tries have been used. This will happen regardless of if the user passes or fails – once the maximum amount of attempts has been used it will send an email. The regular Email Reporting Widget will send the results whenever your user reaches the slide where you placed the widget. You can also use this widget in a project without a quiz and simply use the custom variables functionality to send data to an email address (but not with Adobe Captivate 7!). The widgets will send the data through a server‐side script, which means that the user will not receive a request to send it through their email client as with the regular Adobe Captivate Email Report feature. This means that you need to deploy your project on a web server of some kind. The server needs to be able to execute PHP or ASP scripts. The PHP versions of the widgets are pretty much plug-and-play. Simply upload the PHP script to the location where you uploaded your Captivate SWF to on the server. The ASP version will in many cases require additional setup of the web server due to the way ASP operates. I have added a live demonstration so you can test what the widget outputs. Click below to open the live demonstration. The Live Demonstration also uses the Quiz Data Extension. The widget requires that your content is delivered from an online location (website, webhost etc.) that uses either PHP or ASP. If you are using ASP then the server needs to be able to use the “System.Web.Mail” namespace and you must use ASP.NET 2.0 or newer. Version 3.0+ of the Email Reporting Widget requires that you use Adobe Captivate 6.x, 7, 8 or Adobe Captivate 9. It will not work with earlier versions of Adobe Captivate. 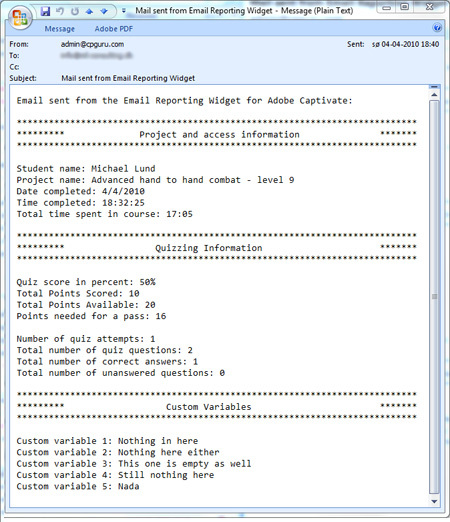 An older version 2.2 of the Email Reporting Widget is supplied in the download in case you want to use Email Reporting in Adobe Captivate 5 or 5.5. If you are using Adobe Captivate 7 or above you must have at least one Quiz Question in your project in order for the widget to work. The widgets will not work with HTML5 Adobe Captivate projects. The regular Email Reporting Widget will on some servers return a weird value for the “Total time spent in course:”. This does not happen with the Email Reporting Widget with Quiz Data. The Email Reporting Widget with Quiz Data does not work if you use Knowledge Check Questions in Adobe Captivate 9. Here you can download a test version of the Email Reporting Widget for Adobe Captivate. The test version is fully functional so please download and try this before you purchase the widget. Question: Can I use this widget in Adobe Captivate projects that are using the Aggregator. Answer: Yes that is no problem but the widget will not be able to aggregate scores from multiple quizzes if they are published in separate SWF files. Answer: Yes provided that your LMS runs from a PHP or ASP enabled server. Question: I cannot see the Widget Parameters tab when I have inserted the widget in Adobe Captivate. Answer: No if you purchase the product you can’t get a refund since it’s a digital delivery. The component has been tested extensively on all types of systems, browsers etc. without any issues. If you are unsure if the component will work for you or not then use the Test Package provided for download further up in this post to make sure first. Question: Can you help me install PHP/ASP on my server? Answer: No unfortunately not. There are people way cleverer than me that can do this for you. Answer: Sure thing – just send me an email through my sites www.cpguru.com contact form and we can work out the details. Question: Will this widget work with Adobe Captivate HTML5 Exports? Answer: No this widget will only work when your project is exported to a Flash based output (SWF). Hi. I’m not an HTML nor PHP expert, so it took a few tries to get the hang of this Widget, but it was up and sending emails appropriately within an hour. Don’t forget to put the sendmail.php or corresponding ASP file in the correct location. Michael answered my questions within minutes, too. Thanks very much. Would recommend this product. Great work Michael, love the update!! Yeah I did get that request a couple of times actually so it might be something to look into at some point. However, Jim’s widget does an excellent job creating PDF certifiates, so I would probably take a different approach to it. Perhaps I could add the ability to generate a PDF in my Print Widget instead because that would allow the Captivate Developer to create the layout and look of the certificate in the Captivate GUI and then use the widget to create a PDF. It is on my to-do list but that is a quite long list. When will the trial version be made available? I had to work on a couple of other projects first, but after tomorrow I should have time to look at the trial version of this widget. Hi Michael, i’m also quite interested in a trial version of this widget to see if i can make something with it in my project. Thanks for your work. I’m sorry that I haven’t got around to creating a trial version yet. Currently I’m working on updating all my widgets to be compatible with Captivate 6. I can send you the trial version of the “old” Email Reporting Widget if you are interested. Thanks for your reply, i’m working on captivate 5.5, I rea1ly would like to see the trial version of the old email reporting widget if it works on 5.5. I also have a real demo version of the widget but in that case I need your email address so I can send it to you. Get in touch through the Contact section on the site and I’ll send it to you. Please note that I will be leaving on vacation very soon. Is there a way for the users email to come on the report so it can be shown along with their name (and perhaps some other info such as their Department or Job role). I tried to do this using the variables and adding the variable to the sendmail.php file but didnt get any joy? Yes you can do that by using the “custom variables” that the widget can send. Basically you need to capture the email address, department etc. in the custom variables (v_custom1 to v_custom30) and then set the widget to transfer these as well. In the PHP file you can then rename the label for each of these variables so they read “Student email” instead of “Custom variable 1:” for example. So this won’t work from an EXE file? @Leo – no this will only work with projects delivered online that have access to either PHP or ASP. Is there a way to change the script to allow the widget to log results and store them until an email can be sent when the computer comes back online? No unfortunately that would not be possible. The Widget and the script requires that it is executed from a server running PHP or ASP. I am very interested in this widget, and I’m wondering if the trial version of this widget will be available anytime soon? I anticipate that it will cover everything I need, but just want to make sure of it. I currently use Captivate 5.5, but Captivate 5.0 would be great as well. That trial widget has been a long time under way now ;o) I’ll see if I can find some time to fix it in the coming week. — For the text entry fields where I am gathering the user input, I’ve assigned each to a variable named per your instructions. Do I need to set any particular On Success property for the text entry fields other than CONTINUE? — How should I configure the button properties? Should I just have the button CONTINUE when clicked, and then put the widget after it on the timeline? Is there anything else besides being visible that I should be concerned about in terms of the SUBMIT button? Thank you very much for your help. I’m working with a remote development team on a tight deadline, so I’d really appreciate as quick a reply as possible. When you have multiple text entry boxes on the slide then it would be a good idea to set the “On Success” properties on them to “No Action”. In regards to the Submit button there is nothing special besides the fact that you need to enter the “Item name” of the button in the Widget Properties. If you experience any problems or have further questions, please contact me through the “Contact” section here on the site. That way I can be sure your comment isn’t caught in the sites spam filter like this one unfortunately was. Demo version of the Email Reporting Widget for Adobe Captivate is now available for download. 1. If the course also contains your Bookmark widget, does the Email Reporting widget still work well? 2. Does it matter what email provider the learner has, e.g., gmail, hotmail, etc.? 1. Yes it will still work provided that the user doesn’t skip past the slide where the Email Reporting Widget is placed. Typically you would place the Email Reporting Widget on one of your last slides, so this shouldn’t be a problem. 2. No that doesn’t matter. The widget uses a server-side script (PHP or .ASPX) to send the email in the background. The user will never see the email being sent. Has anyone tested this widget in Captivate 6.1? I’d be keen to hear from you. This widget is not yet compatible with Adobe Captivate 6.1. The reason for this is that I am currently working on updating the widget with some new features and I will release these together with the Captivate 6.1 compatibility. I expect to release the new version within the next couple of weeks. Based upon your above reply, this will not work with Adobe Captivate versions 6.0.1.240, correct? It does work with Captivate 6.0.1.240 which is the “normal” version of Captivate 6. Currently it does not work with Captivate 6.1 (the subscription version) but I plan to release an updated version within the next couple of weeks. Hi Michael. Are you still working on the update? I have Captivate 7.0 now, subscription version, and I am hoping I can use this behind the scenes. Yes I’m still working on it. I just got back from vacation and I’m picking up where I left now. I’m nearly done – I just need to weed out one final bug that is causing problems. I am very interested in this update too. Without sounding too pushy, is there an eta? Also, will current license holders have access to this update or will we need to purchase a new license? Thanks for all your great work on this. I’m putting the finishing touches on the updated widget now. I expect to release it very soon. Hi, please, works this widget for “likeart” question (scale question) from Captivate 6? Thank you very much. Hi Michael, I am using Captivate to develop an online training for teachers in my state. The online training would be handed off to colleges and universities in my state so that each could host the training on their own websites, as well as collect user information. I’d like to use the email reporting widget so that user information goes to a specific individual at each college or university. This means that I will be creating multiple versions of the same online training for each school (potentially 25 versions). If I create multiple versions of the same training, and then use the widget multiple times for the same Captivate file, can I purchase just one license for the email reporting widget? I hope that makes sense, and thank you so much in advance. Yes that would be perfectly ok as long as you don’t share the Widget files itself or your source Captivate project files. If you just send the various people your published files then one license is fine. Super. Thank you so much for your help, and for a quick response. I am currently using Captivate 6 with v2.2 of the email widget. Is there a way an email is sent when the user successfully passes the quiz? Currently an email is sent when the user completes the quiz successfully or not. I have a couple of questions about the widget that I didn’t find answered in other comments (I apologize if you have already answered these and I missed it). 1. Will the widget work with branching? For example, I have 50 question slides in a project, but every user won’t contact every one of those because some are remedial and users are only routed to those if they answer certain questions incorrectly. As long as I put the widget on the last slide, and everyone gets to that slide regardless of how many questions they answered, will the widget work? 2. Is there a way to send the report to multiple email addresses? I know you can send it to the user and to one email address designated in the widget, but is it possible to enter two email addresses in the widget? I am using this for training and research, and would like the reports to go to the users’ instructor as well as myself. Hey Mike, this was the solution I was looking for! Awesome! One more question before and see this happens yet to anyone else. I ran the demo inside of Captivate and I was able to get the email functionality to work. I’m not sure I follow – did you try out the trial widget? You need to publish your project and upload the published files as well as the sendmail.php or sendmail.aspx script to a web server. This widget does require a web server in order to send the email. Yes, I’m testing out the trial widget. I published the project and put the sendmail.php file on my WordPress server (which I’m certain is both PHP-enabled and has mySQL. I also made sure to choose a custom path where the script is and click the check box so the widget knows it’s not in the same directory. I also made sure to use the full URL of the php file (http:// <-included). The funny thing is that it works, and I receive and email confirmation when I preview my course within Captivate. However, when I publish locally and view the published SWF file in a web browser, no bueno. Here's a piece of information that may be helpful. I tested the same publish swf file, with another separate SWF player, locally again, and an email came through. It seems maybe there's something weird that happens when I use a web browser. I tested Chrome and IE. Both went through the whole course, but both web browsers did not end in an email. Only in Captivate and in a SWF player did an email appear. Phew. I know it was a lot, and I'm sure if it'll help but hey let's see. Aaah ok.. I think I understand. So you have put the sendmail.php file on a server but you are running the content locally from your own computer right? In that case it won’t work in a browser due to the Flash Player Security policies. A Flash SWF file can not communicate with a network location if it is played locally on a computer. This is due to security sandboxing and that is why it won’t work. There is no way around this as it is one of the fundamental security rules in Flash. I’m actually very surprised that it worked in Captivate preview – I wouldn’t have thought that was possible, but apparently the Captivate preview uses some different security settings. please go through your code and let me know the changes. Chances are that you either made an error in the code saving the data to the database or you have an error in a question causing things to break. Do you have any “Short Answer” questions without a correct answer set? Did you include a survey questions etc. I resolved it, there was a fault in my question set tag. thank you. Excellent – happy to hear that. When will an html5 version be available? When will you be supporting html5? Does your widget return the username of the student who logged in? My students could be using various laptops or even borrowing one from their comrade but they must login to access the server. Having their username is essential for me. Thanks. 1) Add a Text Entry Box and make the student enter their name. This could then be mapped to the cpQuizInfoStudentName variable. We are looking to purchase some licenses for the widget. The cost is $50 for a license, is this charge a yearly charge, or a one time charge. We would more and likely purchase one of the package licenses of 5 or 10 users. The $50 is a one time charge flat fee for one developer license. There are no recurrent charges of any kind. Thanks – One more question – what information do you need for each devleoper – I need to submit this request through Procurement and how should I identify who the developers are. In order for them to obtain the widget will you be sending a link with a logon and password in order to download the widget? I don’t need the specific details of each developer. Someone from your company needs to purchase the widget with the appropriate number licenses and that person will receive an email with a download link to the widget. You can then distribute the downloaded widget to your developers internally. Kindly note that when I update the widget I will send out an automatic notification and download link to the new widget. This will be sent to the email address entered when purchasing the first time. Is there a contact number that I can have to put on the request form that I need to fill out to purchase the software – if you don’t want to put it here. Please send it to my email: cdelbrugge@bcbsm.com. They are also requesting an company address and contact email address as well. I have been using this for sometime and it works really well, but I was wondering if there is a way to get it working if you use Knowledge Check Questions in Adobe Captivate 9. I do not need it to send any info about these questions, just about the quiz . At the moment it does not seem to send an e-mail at all when we add a knowledge check question. Would be great if you could let me know if there is a work around for this problem. Unfortunately the Knowledge Check questions that Adobe has added in Captivate 9, does not follow the same standard and format as the other questions. This essentially means that when the widget tries to get the data from the Knowledge Check question it fails as it doesn’t understand the data Captivate returns. The only way to actually get it to work, is to reprogram the widget to account for this new question type and that is unfortunately not on the table right now. You could use the standard Email Reporting Widget ($35) to just get the general data. That will work with projects containing knowledge checks, but of course won’t return any details about the individual questions. I’m using your email widget and everything works and our team even figured out how to pull the data from the email to and SQL Database for further analytics. My hiccup is the back button stops functioning correctly. It freezes when you go back to the previously question and it won’t let you change the answer or get back to the last question. Is this due to using the email widget and if so is there a workaround for it so we can use both the email widget and the back button? I have been using your widget successfully for the past few years but are now looking for an HTML5 solution. With your experience in this field can you suggest what the best option might be? Would really appreciate your input in this. You are in luck.. I will be releasing a new widget which is 100% HTML5 compatible shortly. This widget will allow you to send and store data directly in Google Sheets as well as send it by email. I hope to be able to release this new widget in the very near future. I’m doing the final tests now.